Team Glazer talks to Joe about its call to take action on Mike Smith. 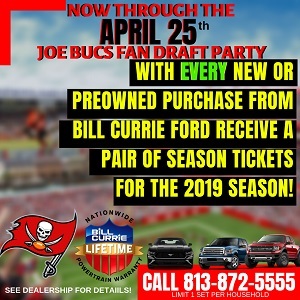 Bucs fans, including Derrick Brooks, have said repeatedly that Team Glazer’s bold move to throw bags of money at Mike Smith so he’d forget about becoming a head coach was the most significant transaction of the offseason. Joe went deep on that subject with Team Glazer last night at the NFL Owners Meetings in Phoenix. Here is the full back and forth. 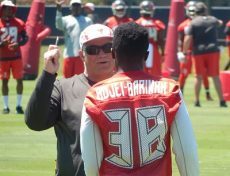 JoeBucsFan.com: It’s uncommon for NFL owners to make deals with defensive coordinators like the one you did with Mike Smith to lock him up for two more seasons. Why the extraordinary commitment and how did that decision play out? Bucs Co-Chairman Joel Glazer: We just felt that stability was crucial. And we’re very happy with the job Mike did last year. We think he has a fantastic working relationship with Dirk, last year and previous years, which we always think is crucial. And we just felt that if Mike was to leave, and to bring in a new defensive coordinator after one year of Dirk being the head coach, it would create a lack of stability. It just was not going to be positive. Things are headed in the right direction. Things are trending, defensively trending in the right direction. There’s a new system, people are learning a new system. Coaches are critical. Whether it’s a head coach, defensive coordinator or position coaches, they are key, critical elements to the success of an organization. So we felt that it was crucial that we keep that continuity. Joe: Would you say it was a last-minute call on Mike Smith? Can you describe how his new contract went down? Team Glazer: I think Mike always knew that we felt very fondly of him. Again, once the season ends you reflect on certain things and look at the situation, and that’s when we started discussions that we really would like to [keep him]. What can we really do to make him forget about head coaching for a while and focus on the job here, and really finish the job? Ahh, yes, “finish the job.” Say it again, Joel. Say it loud and proud! That means Super Bowl, returning the ultimate glory to Bucs fans. The Mike Smith call by Team Glazer should not be swept under the rug. It was so big time. Stick with Joe through this week and next for much more from Team Glazer, And if you missed yesterday’s first installment of Joe’s 1-on-1 with Glazer, it’s right here. Without Smitty, playoffs would be an unknown. With Smitty, how deep into the playoffs would we go? Great way to start the off season. Money well spent. The owners want their team to win the Super Bowl? Shocking development and terrific reporting! Throwing the $4 or $5M per year Mike Smith’s way was a bold move and does show that the Glazer boys are dedicated to winning another Championship. I was surprised we were able to get this done and get a 2 year commitment from Mike Smith but am very happy we will have our continuity on defense. That 5 game winning streak towards the end of the 2016 season had a lot to do with the defense putting it all together and there were a couple games where the pass rush was looking as good as I’ve seen in at least the last dozen years or so. If our DL can stay healthy this year (unlike last) and continue to improve – we might just be looking at a deep run into the playoffs in 2017. Keeep em coming Joe! Thanks! Dallas, I wonder how many times you have been blasted in your mouth for being such a douche bag. Absolutely was crucial!!!!! So pumped!!! Go Bucs!!!! We are so fortunate to have the jaboo/ koetter and kwon/Smith combo. Both combinations fit each other to the T. That is the part people dont realize is so importamt to a teams success. So it doesnt surprise me kwon and smith got the same treatment as koetter and jaboo did last year . continue to build the defense…..we still need a LB, DT and S…. @Tampa Tony- I whole-heartedly agree. As far as his “accomplishments”, he gets an incomplete. The defense played “well” in half the games. That’s hardly a ringing endorsement. Don’t get me wrong, I’m glad he’s back for continuity sake. I hope his retention leads to improvement over last year. The Cowboys right now are a prime example of what good coordinators can do for you. They have a bobble head doll right now as a Head Coach but they have Scott Linehan, Rod Marinelli, and Rich Bisachia at the coordinator positions. Right now, Mike Smith means almost as much to this team as Jameis does. Well they better hurry and build that damn wall or they will be giving COACH MIKE SMITH another MONY BAG! Our Strong side linebacker is on the field less than 50% of the time. If Daryl Smith retires, and stays retired, we have Devante Bond. If we need a SLB, I say sign Hardy Nickerson ll as a UFA. He has it in his Blood!! Probably have to beat the Cowboys to advance in the imagined playoffs that can’t be far off. It’s a great move, very similar to the way the Bucs took care of Monte Kiffin so he would stay here. Kiffin was essentially the “Head Coach of the Defense” and he did a tremendous job for many years. Let’s hope Mike Smith gets the same latitude and delivers similar results. I hope the comtract Smith signed calls for him to groom his replactement. Bravo Team Glazer. Finally a right move in Hillsborough county. We will see just how big time it is….did they change the ruke to no more bumping the recievers within yhe first five yards? I think that will depend on how the draft goes, because the defensive signings in free agency have all been depth signings (at least they would be on any good team). Well at least we can’t cry anymore about the Glazers being cheap or not caring about winning. No argument here that they made a lot of bad moves with the Bucs in the past, but kudos to them for at least seeming to learn from their mistakes and doing what they can to make this team relevant again. Things do (hopefully!) appear to be heading in the right direction again. plus smitty has stated he wants more 34…..you want to depend on bond?…a player that has struggled with injury since he was a sooner….or depend on YET ANOTHER udfa?….NO THANKS….continue to build the defense…..GO BUCS!!!! Just like what was done with Monte back in the day. Great move by the brass. Looking forward to seeing improvent in the 2nd season on this Defense. We could get better in a massive way if we can somehow find a passrush but that looks bleak.